After our workshops each day, enjoy an hour and a half of downtime. Enjoy a stroll in the woods, a meditative labyrinth walk, or a nap, or use the time to read, catch up on correspondence or social media, or enjoy private conversations with your new friends. 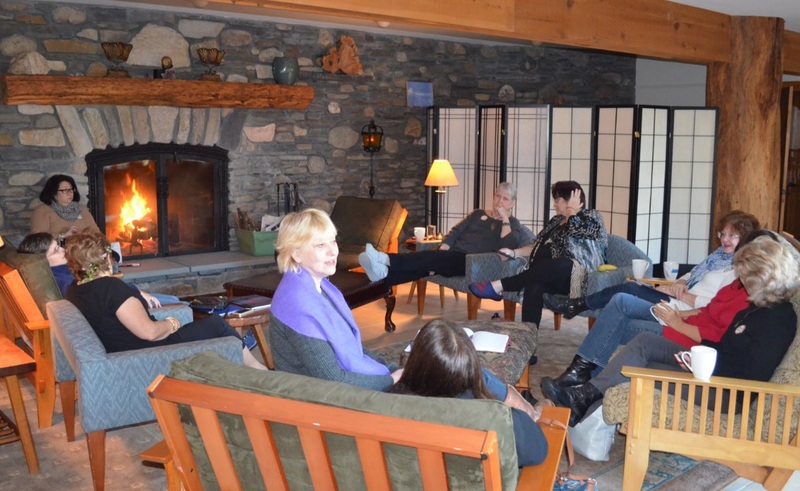 Then at 5:00 come to Cedar Heart Lodge, pour yourself a glass of wine and fill a plate with munchies, and settle into a cushy chair by the fire for a communal discussion. On the first night, we'll be guided in a lively discussion by the inimitable WAW alum Diane Baranello: "What Matters Most at This Career/Life Stage?" Then on Saturday and Sunday nights, we'll devote our minds and creative juices to the problems, goals, or challenges that each of us brings to the retreat. If you want to present your personal dream, challenge, or need to the group and receive the collective intelligence, skills, and offers of help from all the women present, sign up on the schedule board ahead of time to claim your spot during one of those two evenings.